You can see and feel what is going on with Jim Leavitt‘s defense: they are developing confidence, and they have bought into what Coach Leavitt is teaching. It shows with the hustle and the technique that did not occur last year. Troy Dye is about to make a play! Moving Troy Dye to inside linebacker was simply brilliant, as he is in a position to make more plays for the defense than last year at outside linebacker. You can see his rapid recognition of plays, and his explosive closing speed through the alleys to crunch tackles. Boy, he has a tremendous sense of timing on his blitzes, and he’s sneaky fast in carrying them out. It is a wonderful example to potential recruits of what can be done in the Leavitt defense and where the Ducks are headed. The interviews of players in the Sunday Register-Guard indicated a new culture of creating turnovers. They keep track of them and actually have a goal of three per game! It was thrilling to read, although at times I wish Tyree Robinson weren’t a spokesman for the defense. 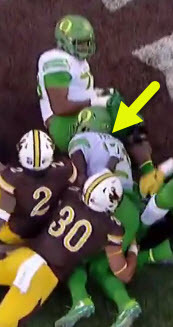 His “chicken-wing” attempt at a tackle in the first quarter brought back unpleasant memories of last year. No matter. The new talent emerging is flourishing in the secondary. It is cool to see Nick Pickett and Thomas Graham have so much playing time and help the winning effort. I never thought we would have so many freshmen putting in major minutes on defense, and yet see such improvement. It was fantastic to see Malik Young and Scott Pagano get into the game and start to knock the rust off. How crucial is this, going into Pac-12 play? I am completely sold on the defensive coaching already. Now it is simply a function of recruiting more of the elite talents, and grooming them to achieve their potential, as the Leavitt staff is doing. It will be a tougher test (by far) in conference, but it is evident that the players, coaches and fans are having a ball with this new defense. What a difference the right leader makes! But that was actually not the most thrilling thing for me with the progress of Griffin. That was his running of the Inside Zone Read for big yardage, due to his understanding of it, his vision and his jump cut. It was well known: Taj could not run inside, and simply did not have the feel or power to pull it off. It took LaMichael James and Kenjon Barner each a year to learn how to run and cut in this play, and it is clear that good things are happening with Taj Griffin in this regard. Note in the short video above how Taj is receiving the handoff and going to the A-Gap on the left side. But he sees the Wyoming middle linebacker (No. 45) filling that gap, so he jump cuts to the cutback hole on the right for a huge 19-yard gain. Yes, I know it was during garbage time against the scrubs, but it indicates a level of understanding with the Inside Zone Read that was not there before. There is a real skill as a running back with this play, and knowing that Taj is a candidate for running back in the future makes us ponder the possibilities. Taggart Doubles Down; Is This Sustainable? We veteran Oregon fans have seen a ton over the years, and when I begin to question some things, know that it is from a position of seeing what has happened before, although I still having confidence in the direction of this program under Coach Willie Taggart. We have seen leadership success and failure, and now it does not take long to recognize the clues. WCT is on the path to greatness as a head coach, but he has some lessons to learn that will only come with some losses that will burn in the resolve. I expressed concern last week about running Royce Freeman 29 times against Nebraska, and having our quarterback, who is incredibly talented as a passer, running more times than I was comfortable seeing. 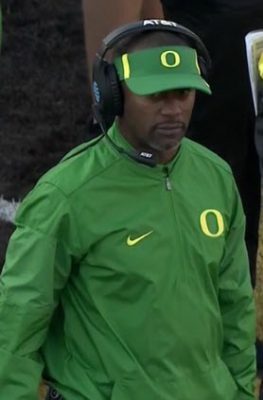 Well Coach Taggart doubled down on that — he had Freeman run 30 times this game with Justin Herbert running NINE times! Can this work for a game or two? Sure, especially in the big ones, but can it work for 12 games and a bowl? Ask yourself, with all you know about Oregon football … is this sustainable? Could we have won the game with Herbert running only on an occasional scramble when no one is open, with Royce at 17 carries? 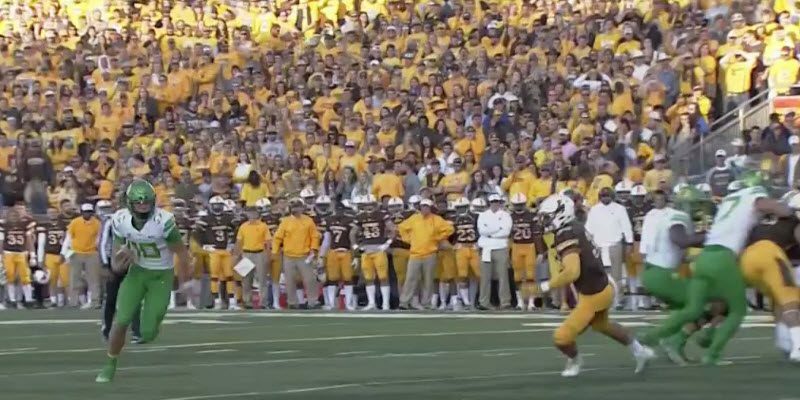 (This was Wyoming, who averaged 62 yards rushing in the prior two games.) Before we get too proud of our Nebraska win … did you know that Northern Illinois beat the Cornhuskers in Lincoln on Saturday? How good are the Ducks? I understand that Coach Taggart is trying to win some games and create a buzz among the media and for recruits. Also, technically, if injuries occur, then the fact this is a rebuilding year makes it less of a lost season. It is evident that better times await the Ducks in future years, as this is a time to recruit talent and for the players (and coaches) to learn how to play in this conference and develop a playoff contender. I like how Oregon coaches outsmarted opponents in the past; they would pull out old plays or introduce new variations off their basic playbook. I don’t see that now. I see diversity in the passing game, but not much in the running game. Hence if you are going to depend upon a superior passing attack from one of the nation’s most talented quarterbacks … quit running him into danger! I love how the penalties dropped to only four from 12 the prior week, so our coaches can solve things and I give credit where it’s due. Overall, this team is scoring wonderfully, and the defense is miles ahead of last year, but a couple of the aforementioned concerns could be deal-killers for the season. Like everything else in life, there are aspects that are superb, and others that are disconcerting. In the meantime … let’s keep pondering and learning more about our beloved Ducks!